Most regions of Japan have four distinct seasons, so if you're visiting in September, October, or November, you'll get the chance to experience fall in Japan with its colorful autumn leaves, unique holidays, and numerous festivals. From strolling through the lush forests of the Daisetsuzan Mountains in Hokkaido to the annual Health and Sports Day celebrated across the country, visitors to Japan are sure to enjoy the seasonal traditions of the Nihonjin people. Typhoon season in Japan is the same as hurricane season in the Atlantic Basin; it runs from June 1 to Nov. 30. The peak months for typhoons are August and September, so if you are planning your trip for the early fall, you should be especially aware of this possibility. But throughout the season, a typhoon could mess up your plans. A typhoon is the same thing as a hurricane; it is just the name used in Asia for this kind of intense rain and wind storm that forms over the ocean and moves onto land. If you have a trip to Japan planned for the fall, keep a sharp eye on short- and long-term forecasts. Across Japan in September, average afternoon highs range from 73 to 82 degrees Fahrenheit, with temps dropping to 64 to 70 degrees across the country at night. In October, afternoon highs range from 66 to 73 degrees, with lows from 57 to 64 degrees. In November, highs range from 57 to 64 degrees, with nighttime temps a chilly 45 to 54 degrees. Even if there's no typhoon on the horizon, you can expect some rainy days in the fall, especially in September and October, with an average of 20 days of rain in September and 17 in October in Tokyo. This number could vary slightly across the country. The sea temperature is relatively temperate in September at 77 degrees (in Tokyo), but by November it's fallen to 70 degrees. The answer to this question depends on when you go to Japan. For a September trip, take a mix of short-and long-sleeved shirts or tees, long but lightweight pants, and a lightweight sweater or jacket for nighttime when the temperature dips. You might like sandals or canvas shoes during this month, but you should also take along something warmer. In October, you'll need long-sleeved tops, possibly a pullover sweater, and a medium-weight jacket for nighttime. You'll need closed shoes, and ankle boots would be a good choice, especially later in the month, when the temperature is on the lower end of average. In November, the temps take a plunge. Take what you'd need in October, along with a leather jacket or similar. You'll need layers at night to stay warm. Those ankle boots are a great choice for shoes in November as well. Pack a collapsible umbrella no matter when you go since you are likely to experience a few rainy days. Renowned fall foliage is the main draw in Japan during this season, but there are also interesting holidays that give you a peek at the culture of the country. Taiiku-no-hi (Health and Sports Day): This holiday, on the second Monday in October, commemorates the Summer Olympics held in Tokyo in 1964. Various events take place on this day, which promotes sports and a healthy, active lifestyle. Bunkano-hi (Culture Day): On Nov. 3 each year, Japan holds many events that celebrate art, culture, and tradition. Festivities include art exhibits and parades as well as local markets where you can purchase handmade crafts. Shichi-go-san: This traditional Japanese festival on Nov. 15 is for 3- and 7-year-old girls and 3- and 5-year-old boys. These numbers come from East Asian numerology, which considers odd numbers to be lucky. However, this is an important family event, not a national holiday; families with children of those ages visit shrines to pray for the children's healthy growth. Children buy chitose-ame (long stick candies) that are made of a rare kind of sugarcane and represent longevity. On this holiday, children wear nice clothes such as kimonos, dresses, and suits, so if you're visiting any Japanese shrines around this time, you might see many children dressed up. Labor Thanksgiving Day: On Nov. 23 or the following Monday if Nov. 23 is on a Sunday, the Japanese celebrate this holiday, also called Niinamesai (harvest festival). It is marked by the emperor making autumn's first offering of harvested rice to the gods. The public holiday also pays homage to human rights and workers' rights. Nada no Kenka Matsuri: Also called Fighting Festival, this annual event is held Oct. 14 and 15 in Himeji at the Omiya Hachiman Shrine. Portable shrines set on men's shoulders are knocked together in an age-old display of dominance. You might be able to see some Shinto rituals held at various shrines, as well, and it's fun to visit the many food vendors that sell local specialty food, crafts, charms, and other regional items at the festivals. Fall Foliage: Fall foliage in Japan is not a formal event, but it is by far the most celebrated part of the season. It is called kouyou in Japanese and means red leaves, named so for the bright displays of red, orange, and yellow that dominate the visual landscape of Japan. The country's earliest fall foliage occurs north of the Daisetsuzan Mountains in Hokkaido, where visitors can take a hike through the colorful trees in a national park of the same name. Other popular fall foliage destinations include Nikko, Kamakura, and Hakone, where you'll experience spectacular colors and breathtaking views. In Kyoto and Nara, which both were once Japan's ancient capitals, the colorful leaves match these cities' historical architecture and attract many visitors during the fall; here you'll find Buddhist temples, gardens, imperial palaces, and Shinto shrines. 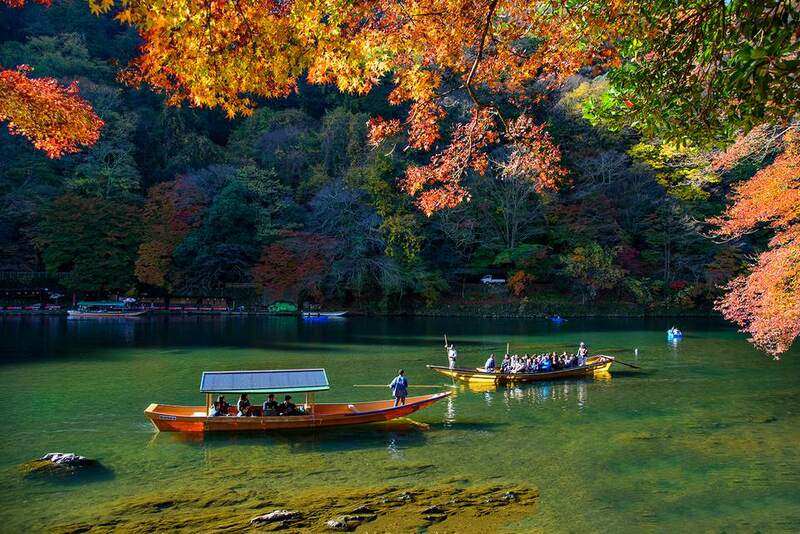 Fall is an ideal season to visit Japan. The weather is ideal for being out and about, and the summertime crowds have diminished considerably. The fall foliage is a spectacular attraction. If you are traveling in September or October, be aware of the possibility of a typhoon. If it's in the forecast, it's best to reschedule your trip. Even though the crowds are gone, you still need to book reservations in hotels since the fall foliage is a big draw across the country, especially in Kyoto and Nara. Expect rainy days. Look at the short-term forecast when you get to Japan and plan your itinerary so that you'll be inside museums when it's wet and have sunny days for walking around the cities, shopping, or taking a drive to see the leaves. Check the specific weather forecasts for the region of Japan you are visiting, since the weather varies from north to south during this changeable season.